Parish workhouses operated at Crickhowell, Cwmdu and Llangattock. The Crickhowell workhouse was on Castle Street. Breconshire: Crickhowell (2), Grwyne Fawr, Grwyne Fechan, Llanbeder Ystradwy, Llanelly (3), Llanfihangel or St Michael Cwm dû, (2), Llangattock (2), Llangenan, Llangynidir (2), Patricio. The population falling within the union at the 1831 census had been 11,305 with parishes ranging in size from Grwyne Fawr (population 21) to Llanelly (4,041). The average annual poor-rate expenditure for the period 1834-36 had been £2,172 or 3s.11d per head of the population. Initially, the union appears to have made use of existing parish workhouse accommodation at Crickhowell (for female inmates) and Llangattock (for males). In 1837, the Poor Law Commissioners authorised the expenditure of £1,150 on a workhouse building for up to 100 inmates, possibly the enlargement of an existing structure, at Llangattock. It appears that the early workhouse accommodation was inadequate and the subject of criticism from the Poor Law Board who, in 1870, recorded that the Crickhowell Board of Guardians had "finally agreed to build a workhouse". The new workhouse, for 170 inmates, was built to the north of Llangattock in 1871-2 on a steeply sloping site at the side of the Brecon canal. Its location and layout are shown on the 1902 map below. The workhouse master's house, at the centre of the site, is a now a private residence known as Hengwaithdy. 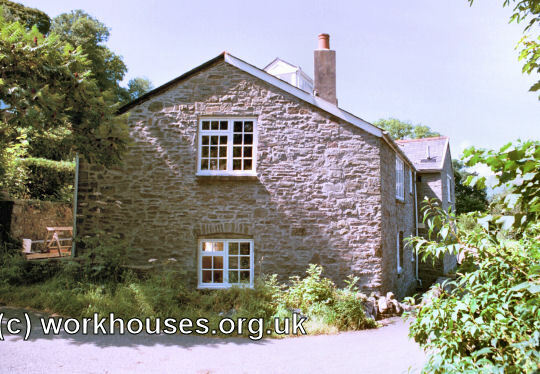 Former Crickhowell workhouse master's house from the east, 2000. Part of the inmates' accommodation survives in a house now known as Vagaland. 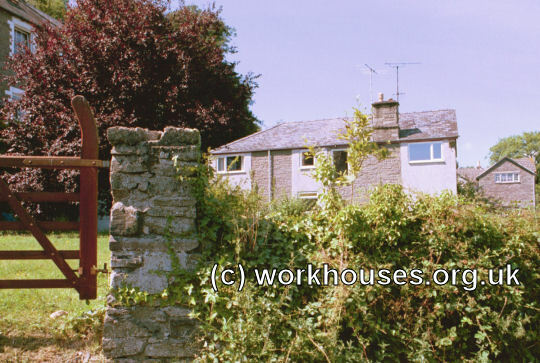 Former Crickhowell workhouse inmates' accommodation from the south, 2000. The infirmary block is now occupied by the Ty Croeso Hotel. 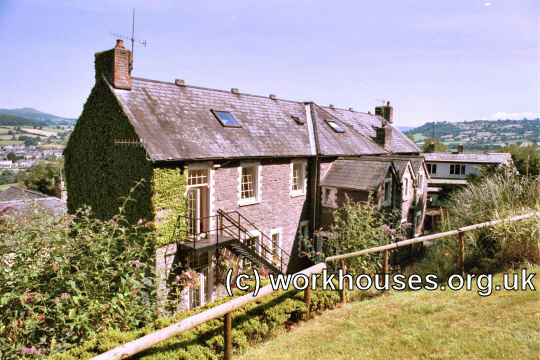 Former Crickhowell workhouse infirmary from the north-west, 2000. The former casual ward and laundry survive in a property now known as Swn-y-Dwr. 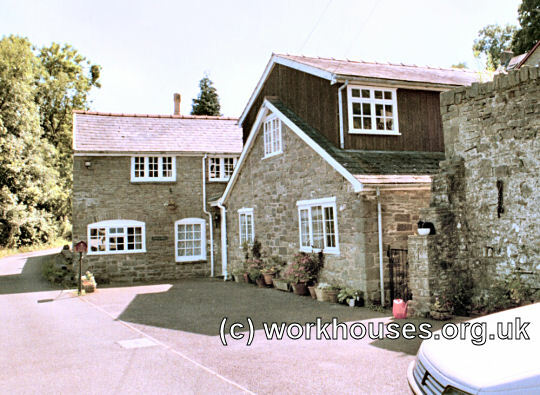 Former Crickhowell workhouse laundry (left) and casual ward (right) from the north, 2000. 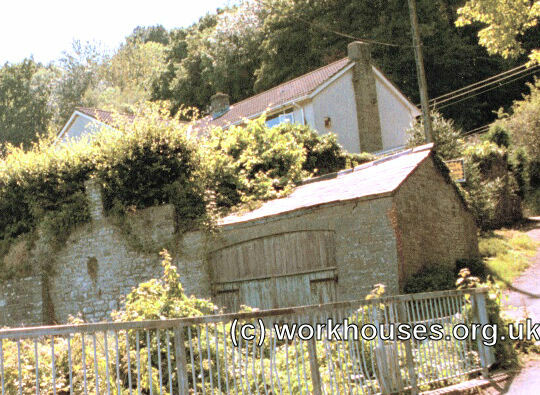 Former Crickhowell workhouse laundry from the south, 2000. The former workhouse chapel has been converted to a house now known as Okefenokee. The stabling for the workhouse hearse still survives. Former Crickhowell workhouse chapel (upper centre) and hearse store (lower centre) from the north-east, 2000. In October 1841, the Board of Guardians' Visiting Committee held a meeting to examine allegations of the alleged misconduct of the master of the workhouse, Mr Allan, in taking improper liberties with one of the female inmates, and for drunkenness and irregularity. The inmate, Mary Thomas, was the mother of a five-month-old illegitimate child. The said that after her child had begun to cry and disturb a Sunday afternoon service in the workhouse chapel, she had taken it to her room. Shortly after, the master came to the room where he put his hand around her neck and attempted to put his hand under her clothing. He said he would give her money to buy clothes for her child if she allowed him to do so. He then kissed her. The workhouse matron, Mrs Mainwaring, testified that on a more recent occasion, Allan had visited a local market and did not return until 10p.m. and was inebriated. The following night he was out again, this time until midnight. On being called before the meeting, the master admitted the allegations and was discharged from his duties. 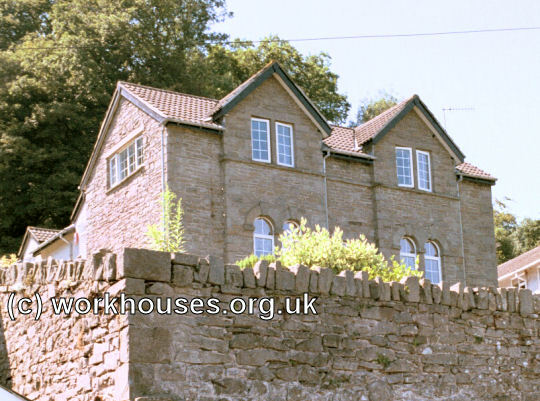 After 1930, the former workhouse premises became a 105-bed Public Assistance Institution known as Llanyffwddog, and also referred to as Welfare House, under the control of Breconshire County Council. During the Second World War, members of the British and Free Belgian forces stationed in the area were accommodated at the workhouse. Officers were housed in the infirmary block, with lower ranks in the laundry and casual ward. Masters: Samuel Mainwaring (1836-1841); William Lewis (March-April 1841); Mr Allan (May-October 1841); Edward Clinton (1841-); W. Goodere (by 1846 to 1849); R. Dunham (1850 to at least 1862); T. LLoyd (by 1866); W Richards (1867-); Mr Goodchild (1900-1929). Matrons: Mrs Mainwaring (1836-); Margaret Phillips (in 1881); Mrs Goodchild (1900-1929). Powys County Archives Office, County Hall, Llandrindod Wells, Powys, LD1 5LG. Very few records survive. Holdings include: Guardians' Minutes (1836-43, 1872-96); etc.